From the comments section in An Open Letter to Milbloggers, journalist Ben Shaw gives us this very depressing perspective from Afghanistan. I have also discovered that if I publicize these findings (that literally 95% of troops don’t believe in their own mission), the Soldiers who I cite will be charged, potentially relieved of command, and I will be asked to disembed from these units. As a recent example, I filmed approximately 75 minutes of combat footage, knowingly exposed myself to concentrated enemy fire, and learned two days ago that if I post this footage, the Soldiers on film will be charged and/or relieved for uniform violations, improper wear of personal protective equipment (ballistic glasses, fire-retardant gloves, etc), and that low-level commanders have already begun this process. In an attempt to preserve the careers of the Soldiers I am trying to advocate, I am unable to tell (or show) the US public what they’re experiencing and what they think of it. The military only wants good news to flow from embedded journalists – not facts. The reality is this: the current tactical directive leaves US troops on the ground increasingly vulnerable, often unsupported by air assets or indirect fire, and as a consequence their personal mission is to keep each other alive and come home. Under this current “soft war” policy, the war cannot be won. After all, Pashtun Islamic culture sees any sort of kindness and mercy as a weakness – and immediately exploit it. The Taliban, knowing the restrictive nature of the current ROE/Tactical directive, use it against US forces regularly. US troops feel abandoned by their chains of command, bilked by military recruiters, and participants in a conflict that history will not treat kindly. They will return to the US and to civilian life full of disappointment, bitterness at their commanders, and unwilling to serve again. And military commanders here are doing their very best to ensure that this never reaches the public. In their pursuit of mission accomplishment, they have altogether neglected their second purpose: troop welfare. The former, however, will never be realized without an equally dedicated concentration on the latter. I invite comments and criticism at byshaw@gmail.com. As of today, my photos, videos, and writing have been so closely monitored by the command that I have elected to remove all imagery for fear of jeopardizing the troops on the ground. Commanders are using the images and footage to threaten Article 15s for Soldiers photographed out of uniform, and also threatening to relieve platoon sergeants and first sergeants for allowing such things to happen. Professionally, I have been bound and gagged – that is unless I’m willing to burn an entire troop (or squadron) of Soldiers in the process of telling the US public what’s happening – which would be counterproductive. My next step will be to file a formal complaint with commanders who use media resources to incriminate their own subordinates. This command, I have determined, is far more concerned with looking pretty than accomplishing their mission. I also think that, somehow, the US public needs to know about it. The entire report is very depressing for me. I won’t weigh in on the full account, but I’ll address one aspect of it. It really is disgraceful that command, whether NCOs or field grade officers, is spending any time at all trying to push paperwork over PPEs in the field. This is very disappointing for me to read. Colonel Mullen who commanded 2/6 in Fallujah in 2007, for whom I otherwise have an immense amount of respect (and by the way, so does my son who told me he would follow Colonel Mullen and First Sergeant Dagenhart anywhere on earth and to the gates of hell too), nonetheless disappointed me during the summer of 2007. I suspect that Ben is embedded with the Army, but this focus on unimportant things isn’t just restricted to the Army. The Marines engage in their share of stupidity. In April of 2007 the men from 2/6 left their Marine Corps issued sand/desert boots behind in the Barracks (clodhoppers they were, with heavy Vibram soles) and purchased more user-friendly, ligher, more comfortable boots (which looked about the same) from Tactical Applications Group, TAGs, just outside of Camp Lejeune. Slab with OPFOR knows where I am talking about. They also ditched the IBA (Interceptor Body Armor) outer shell (or tactical carrier), and opted for the Spartan II also at TAGs (the civilian version of the Modular Tactical Vest which had not yet been issued, but the Spartan II was also better than the MTV). Along comes MARADMINs, and the men had to throw away all of the boots they purchased from TAGs (while actually deployed in Fallujah) and use the heavier MC issued boots that had to be sent later, creating logistical problems that didn’t otherwise have to exist. On the bright side, they all looked the same. Yes, they all looked the same. At least they got to keep their Spartan II carriers. Next, as I was writing Operation Alljah, I linked this photograph taken by a stringer in Fallujah. To which Colonel Mullen, while giving me his incredibly useful interview, responded that these Marines could not be 2/6. They weren’t wearing the right clothing. To which I responded, “Sir, this is 2/6 Golf Company, 3rd Platoon, and the one being carried in the middle is my son after he sprained his ankle jumping down from the roof of a house while being shot at. He’s bent over because he is taller than they are – I know them. The one on the left is carrying his SAW and providing cover. We found the photo on Yahoo and talked to him about it.” I believe that this is in the industrial district of Fallujah. That particular patrol was over for my son, with light duty for a week or two. Later my son told me that they would always make sure to wear the right clothing, with sleeves cleanly rolled to just the right length, no matter what the sun was doing to them, when they passed a certain place in Fallujah. This particular place was where a camera was mounted, streaming to the Pentagon. There were enough high powered cameras in the area that he could look at Camp Fallujah from FOB Reaper on the South side of Fallujah and tell if a Marine had not shaved that day. You know. You want to make sure that you look right and everything. That’s what really matters. Hmmm … that Marine second from the left at 5:35 looks very familiar. Graeme Wood at The Atlantic pens a piece that questions what Fallujah will be like when the Marines leave Anbar. A dispatch by Rod Nordland of the New York Times asks whether the violence in Fallujah — lately viewed as a model of an Anbar city pacified and handed over to the Iraqis — is really in remission. His excellent report, filed from Fallujah and from the even more restive nearby town of Karmah, where I just spent two days, leaves the question unanswered but suggests a reality darker than the version the Marines describe. Stop there. Let’s go take a look at the New York Times article. Falluja was supposed to be a success story, not a cautionary tale. After all, by last year the city, a former insurgent stronghold, was considered one of the safest places in the country. Local Sunni sheiks had driven out the insurgent group Al Qaeda in Mesopotamia and held successful elections, and American engineers were hard at work on a showcase reconstruction project: a $100 million wastewater treatment plant meant to be a model for civilian advances in Iraq. Then a series of troubling attacks began cropping up this year. One in particular, at the end of May, seemed to drive home the possibility that things were changing for the worse. On a heavily patrolled military road between a Marine camp and the wastewater plant, a huge buried bomb tore through an armored American convoy, killing three prominent reconstruction officials and striking at hopes that the way was completely clear for peacetime projects. We covered some of this in The Violence Belongs to Iraq Now. But dissecting the NYT article a little further, even the initial part stumbles into problems. Local Sunni sheiks didn’t drive anyone from Fallujah. The author is confusing what happened in Ramadi, where a combination of tribes and Marines drove al Qaeda from there, and in Fallujah, where al Qaeda went after they were driven from Ramadi. Tribe had little affect in Fallujah, and the notion of Muktars held much more sway. When the 2/6 Marines deployed to Fallujah in April of 2007, the population was so afraid of al Qaeda that they would send their children out to surround Marines on patrol, waving black balloons so that al Qaeda mortars could target the Marines. The children were at risk as much as the Marines, but this speaks volumes about the condition of Fallujah early in 2007. On my first afternoon, I spoke with the base’s senior Marine, Lt. Peter Brooks, about the chagrin his men felt at having to serve as a withdrawal force, rather than a high-intensity killing force like the more fortunate Marines currently machine-gunning Taliban in Afghanistan. They spent their days working out, conducting mock exercises with scale models in the sand next to their hut, and guarding their static and rather sleepy position. Midway through our chat, we heard small-arms fire, full automatic and not a thousand meters from where we stood. I expected a reflex dash into response mode: a quick reaction force, sets of eyes and weapons scanning the horizon for threats. In fact the response was orderly but serene. Rather than scramble into action, Iraqi police looked around unhurriedly, eventually spied a convoy of vehicles, and determined that the automatic bursts were “probably” just a wedding party. The alarm was canceled before being sounded. By now few foreigners in Iraq have failed to register that blasting the sky with machine-gun fire is the Iraqi chivaree, and that weddings are wonderful events — symbols of peace and unleashed merry-making — at which normal rules of social decorum don’t apply. But if I were an Iraqi best man, I think I would probably have refrained from firing wildly into the air until my convoy traveled at least a few hundred meters past the station filled with ill-trained Iraqi cops and tightly coiled US Marines. The atmosphere seemed not so much one of safety or celebration but of impunity. Whatever the base’s function, it was not for community policing, and certainly not for aggressive patrols by Marines preserving the peace from carloads of young men with weapons. Several thoughts come to mind. First, a police force that does not respond to unexplained gunfire is not a police force. Okay. Stop again. The gunfire could have been anything, including shooting dogs. A breed of wild dogs has taken to residing in Fallujah, and each block has its own pack that relies on food it can get from the area to survive. Residents of Fallujah routinely have to defend themselves against these dogs. These are not domesticated animals. These are several-generation wild dog packs that have no inhibitions regarding humans. The narrative is that the Marines leaving will cause problems for security and that the Iraqi Police are not up to the job. True or not, the Marines must leave. It isn’t within the Marines’ mission to remain a large, heavy land based occupation force. Rapid deployment strike troops must return to their primary mission. Anbar is better for having the Marines there, but even if security degrades, it will recover. The Iraqi Police are up to the task, or shortly will be. A more sophisticated understanding is given to us in the comments section of the Atlantic article by Jon Schroden. – This piece fails (as does the NYT piece) to paint a truly comprehensive picture of the security situation in Al Anbar because it presents but a single data point. To get a truly balanced sense of security there, the author should have also traveled to Ramadi, Hadithah, and Al Qaim, at a minimum. Each of these cities is different in multiple ways, so reporting on those differences and how they translate into the varying security situations amongst the cities would have been much more enlightening and comprehensive. – No one who has seriously studied the situation in Al Anbar or spent significant time there would hold up Fallujah as the shining example of a city that has been turned around. Ramadi is typically the example cited, and for good reasons – it truly was a hot-bed of insurgent activity that was pacified through sound counterinsurgency methods, changes in local attitudes and working with the tribes (to wit, Ramadi was once the declared capital of AQI’s “Islamic State of Iraq,” but was also where the Awakening began). Fallujah has always been trouble. Even after two full-on, line-em-up and knock-em-down clearings of the city, it was still rough-and-tumble, so in late 2007 the Marines began a district-by-district clearing of the city again, using the types of less-kinetic techniques that worked in Ramadi (this was called Operation Alljah). That worked to a large extent, and the city was better for it, but the fact remains that the people in Fallujah have always viewed themselves as a special case (in part b/c Saddam treated them that way) and as such they will always be hard to deal with. They feel that Fallujah, not Ramadi, should be the capital of Anbar, and are disgruntled because of it. Also, Fallujah is a lot “less tribal” than Ramadi, so it’s more difficult for local power-brokers to control the people there. – As for the Karmah region, the description in this article shows a lack of understanding of the tribal dynamics there. Karmah, and its surrounding areas to the east of Fallujah, sit astride the boundary between two tribal confederations – the Dulaimi Confederation to the west (which includes almost all of the Al Anbar tribes), and the Zobai Confederation to the east (which stretches into and around Baghdad). The main tribe in Karmah belongs to the Zobai Confederation. As such, Karmah represents a “special case” when it comes to dealing with tribal alliances, because the people there don’t really fit in to the rest of Anbar and so feel they aren’t represented well in the provincial government. The main sheikh in Karmah is also a coward, who fled Anbar and would only return in 2007 after heavy lobbying by the Marines and with guaranteed security measures in place. Hence he is of little utility in helping to control the situation there. – Finally, to the line “a police force that does not respond to unexplained gunfire is not a police force,” I would simply respond that we need to be very careful in our tendencies to apply western standards when it comes to things like quality of police, levels of security, etc. Iraq is not America. Our goal in Iraq is not to build Fallujah into a shining example of a modern city. As long as it’s reasonably peaceful and isn’t serving as a safehaven for AQI (which it isn’t), then we’ve accomplished our mission and the Marines should come home. And they are. This comment might have been left by Dr. Jonathan Schroden of CNA, who has also penned an interesting article entitled What Went Right in Iraq. It is an interesting read and requires our attention. The Marines have a vested interest in the Anbar Province, having lost more than 1000 warriors to the fight. Much blood has been spilled on Anbari soil. But other fights and other missions beckon the Marines. May the Anbaris find their peace and security. We will pray that the security infrastructure is up to the task of providing it. The final preparations are underway for the U.S. Marines to leave Fallujah. To be sure, the threat of violence has not vanished. But the police said they were proud that a place that suffered a major attack a week just a few years ago has had only two in the last six months. The view that the town is better off taking care of itself was echoed by residents, even in the neighborhood hit by the most recent big attack, in early December, when suicide truck bombers linked to Al Qaeda in Mesopotamia killed 19 people, wounded dozens of others, and leveled nine houses and two police stations. Camp Falluja will be handed over to the Iraqi Army, with most of its marines relocated to Al Asad Air Base, about 90 miles to the west. A smaller contingent will remain at nearby Camp Baharia. The move reflects the confidence of the American command that major violence will not return here. “It won’t happen again because the Iraqis don’t want it to happen again,” said Colonel George Bristol, the bald, heavily muscled commanding officer of the First Marine Expeditionary Force Headquarters Group at Camp Falluja. At Camp Falluja, Major James Gladden and Master Gunnery Sergeant Ray SiFuentes are overseeing the dismantling of a base that had once been home to 14,000 marines and contractors. The 2,000-acre post had its own fire department, water treatment plant, scrap yard, voter registration booth, ice-making factory, weather station, prison (for insurgents), beauty shop, power plant, Internet café, Turkish bazaar and dog catcher. Its chapel could fit 800 marines for religious services, a Toby Keith concert or a performance by the Philadelphia Eagles cheerleaders, all of which were held there. “We had basically everything a small town had,” said Gladden, 34, who is known by other marines as the mayor of Camp Falluja. “Everything except fast-food outlets,” he said, which were deemed too unhealthy. There are only 200 marines left now, and about 170 truckloads a day leave the base, most headed for other United States military installations. Even the gaggle of geese from the camp’s artificial pond, which some marines had adopted as pets, has been taken away. One by one, they were trapped and set loose at a larger pond at Camp Baharia. A good deal of packing up involves making sure nothing is left behind that later could be used against American forces. Obsolete armor for trucks, ballistic glass plates for Humvees and concertina wire are cut to pieces. Thousands of mammoth concrete barriers are being trucked to other military bases. First of all, this is a testimony to the difficulty of movement of military materiel and relocation of forces. Logistics rules, and we have long said that the logistics officers will determine when the U.S. withdraws from Iraq rather than the politicians. Second, it is even more a testimony to the bravery of the Marines in Operation Al Fajr, the follow-on operations, and then finally the Marines of 2/6 who conducted Operation Alljah. Three years of blood, sweat and tears have brought Fallujah to this point. The bravery of the Marines has enabled the process to move forward. It’s now time to turn over, and continued presence by the Marines in Anbar would be an improper extension of the the final phase of counterinsurgency. It is finished in Anbar. Separately from another Marine stationed elsewhere in Iraq (perhaps to the North), The Captain’s Journal has received word that they are engaged only in force protection. There is no combat. It’s time to move on, since the victory has been won. The Multinational Force is reporting that Marine Major William G. Hall, 38 of Seattle, died of wounds suffered in combat in Anbar. He was assigned to 3rd Low Altitude Air Defense Battalion, Marine Air Control Group 38, 3rd Marine Aircraft Wing, I Marine Expeditionary Force, Camp Pendleton, California. Actually, the Multinational Force appears to have his rank wrong. Marine Lt. Col. William G. Hall, a Garfield High School and Washington State University graduate, was killed Saturday in Iraq, according to his family. Hall, 38, who grew up in Skyway south of Seattle, is one of the highest-ranking U.S. military officers killed in the war. Hall’s family said the husband and father of four died while riding in Fallujah in a vehicle that struck a roadside bomb. He was on his third deployment there, having arrived in February, and had been promoted to his new rank a month ago. Hall’s wife and mother first learned in a phone call from the Marine Corps that he was in surgery after being injured. Later, two supportive Marine casualty-notification officers arrived at their door and they knew. My heart goes out to the Hall family. This visit by casualty-notification officers is one I awaited late at night for many sleepless nights, and thankfully didn’t get. My thoughts frequently run to Fallujah – a place I have never been. While Lt. Col. Hall cannot be brought back, the Marines can do something to prevent this from happening again. 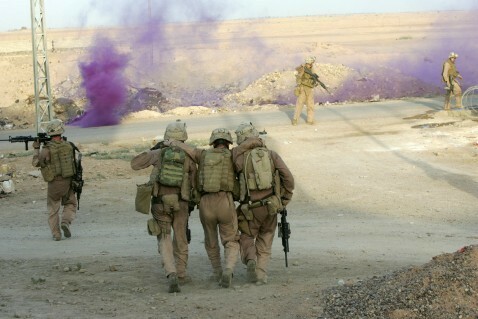 Only a single IED exploded in Fallujah during the deployment of the 2/6 Marines, early in the summer of 2007. After that … no more. It’s time for the Marines in Anbar to make a statement in Fallujah and reinforce the idea that such things will not be tolerated. Ever. We have previously covered Operation Alljah in and around the Fallujah area of operations, involving robust kinetic operations around Fallujah in May and early June, gated communities, interaction with the population, parnership with the Iraqi police, and the use of biometrics for identification of the population. Bill Ardolino is embedded with the 2nd Battalion, 6th Marine Regiment and is reporting from Fallujah. Operation Alljah was the latest and most successful bid to achieve security in the former insurgent stronghold of Fallujah, marrying projection of force with aggressive civil affairs outreach. During the operation, the city was subdivided into 10 neighborhoods in efforts dubbed “the swarm,” a coordinated series of counterinsurgency components: US troops and Iraqi Security Forces rolled into a neighborhood and established security, cordoned it off with concrete barrier checkpoints, created a local police precinct, recruited a neighborhood watch, provided employment for day laborers, conducted an information campaign to inform the citizenry of the operation, arbitrated any claims against Iraqi or US forces, distributed food and began meetings with neighborhood leaders to address infrastructure concerns. Heavy engagement of the population was the hallmark of Operation Alljah. But while the tribes were of paramount importance in Ramadi, the engagement of this operation specifically targeted a heretofore neglected constituency. “When we got here, there was a sheik’s council. But in [the actual city of)] Fallujah, you can’t have a sheik’s council, because they have [Muktars, who are] like city sheiks. Fallujah is not divided by tribes, like in Ramadi. So when we were doing the sheik’s council, we were going nowhere, because the sheiks didn’t know the people … until we started noticing the Muktars. They were like, ‘What about us? How come nobody’s talking to us? '” explained 5/10 CAG Staff Sergeant Mauricio Piedrahita. Engaging Muktars and backing their authority has succeeded where past civil affairs strategies have failed. Projects are now more in line with the needs of the community, and the decentralization of contracting has mitigated serious problems with corruption. During these meetings, the Muktars outline the most pressing infrastructure needs for the district: power (generators), fuel, water and sewage. Bill marks this operation with a counterinsurgency exclamation point. “[The Marines and IP] are not kicking down doors, they knock on the door, they give them time for the women and children to go into a room, they’ll talk to the man of the house, so it’s a different attitude,” said SSG Piedrahita” … Some marines complain about the “boring” nature of the civil affairs focus, while others embrace it. “It’s a change,” said SSG Piedrahita. “But like they say, we’re marines, we adapt to anything. We’re always going to do the job as best we can. Like these guys, the 2/6, are all grunts, all infantrymen. They get trained to kill, in combat, and then we get this and we adapt to it and do the best we can. In a way, it’s good. We’re not getting Marines killed out here.” There has been a certain learned aspect to this operation, and the results have been recognized all the way up to the Commandant of the Marine Corps, who has visited Foward Operating Base Reaper. In an interesting recapitulation of “what’s wrong with this picture,” in Saqlawiyah, 1/1 Marines (of RCT-6) have targeted weapons caches with success. It was late morning when Pfc. Andrew D. Bear noticed the lone cinderblock in the middle of a field. There were no houses, no cement facilities, and no structures of any kind for hundreds of feet. It was just dirt, mud, weeds and the Marines of Company A, 1st Battalion, 1st Marine Regiment, accompanied by local Iraqi policemen. To the Yorba-Linda, Calif., native, the cinderblock, sitting in the sun-baked mud, stuck out like a cockroach in a spoonful of oatmeal. In The Pacification of Fallujah: Is it Fake?, I responded to claims that the pacification of Fallujah occurred at the expense of viability of the city. I responded in the negative. I have been waiting on Bill Ardolino’s first post from Fallujah, and it comes entitled We Like You! where he discusses the ‘astounding’ changes that have occurred since his last visit to Fallujah. The surreality of the change can be summed up by this afternoon. I sat chit-chatting in a downtown precinct with Iraqi cops and newly-minted neighborhood watchmen, junior security officials drawn from the same labor pool that previously drove the insurgency. As was the case last visit, the Iraqis assume that I’m an Arab when they first see me, and express amused fascination when they discover I’m American. Apparently I look like a member of a tribe that lives northwest of the city, whose members sport full beards, lighter brown skin and light eyes. I always respond that there are plenty of Americans who look just like them, because America welcomes all races. Coupled with my prominent camera and status as “a journalist,” I rate somewhere between a bemusing curiosity and a very minor celebrity. Backatcha, buddy. Now I’m off to hit that kabob. Bill is a first-rate reporter and I look forward to more posts on his embed with the Marines. Read the whole article. Repeating from before, there may be bumps in the road in the future, especially with the plan to lift the ban on vehicle traffic. After all, it is still a counterinsurgency. But the counterinsurgency operation by the Marines in Anbar, and more particularly, Fallujah, will go down as one of the greatest, with remarkable progress accomplished in the compressed time frame in which they work. The Pacification of Fallujah: Is it Fake? By invoking the word Potemkin, Robb is suggesting that whether intentionally or accidentally, the pacification of Fallujah is fake. I like to keep up with John Robb. Without studying analyses that run counter to your own one can become rather closed-minded. But what were the conditions like in Fallujah prior to this? I had interviewed Lt. Col. William Mullen concerning the conditions in Fallujah in this article: Operation Alljah and the Marines of 2nd Battalion, 6th Regiment. And so I knew full well what we have had to do to pacify Fallujah. The tribal influence is much weaker in Fallujah, so more traditional counterinsurgency TTPs have been required, such as gated communities. But is Robb seriously claiming that this has hindered true progress or otherwise caused conditions in Fallujah that are worse than they were prior to these actions? Is he seriously claiming that our efforts have caused unemployment or the lack of communication with the balance of Iraq? He misses the point. The unemployment was already there, because it was the last major city in Anbar to undergo pacification. I claim exactly the opposite of Robb. Now … and only now … can Fallujah BEGIN its communication with the rest of Iraq. 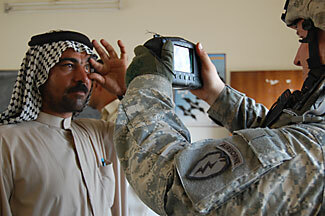 More on Biometrics here from Noah Shachtman: Iraq diary: Anbar’s Boys in Blue. My bet is on the Marines and Fallujans.